What can the GB1900 gazetteer be used for when it is complete? There are a number of different ways we have already thought of for how the data might be used, and we will explore some of them on the progress section of the GB1900 support site as the project continues. No doubt our volunteers will come up with other possibilities which we’d be pleased to hear about. This first example case study is taken from Oxfordshire as the transcription and confirmation progress in this county is relatively well advanced, although not complete. Here we explore using the markers as a spatial index from which you could hang other historical information. The map shows the registration county boundary in 1901 and the confirmed markers for schools existing in the county from the GB1900 map. Those marked as squares are the four identified Grammar Schools, those marked as triangles are Sunday Schools and the rest are circles. Some are named, but most are not. According to the National Grammar School Association website Oxfordshire no longer has any Grammar schools so you could look at the general picture of the consolidation and movement of school premises over the past 100 years. You could use the gazetteer information as a starting point for investigating the history of particular schools, or possibly to help you explore the career of individual schoolmasters by plotting the locations of the schools they worked in. Alternatively you might be interested in religious education and the number and locations of Sunday schools identified in particular buildings on the map is in stark contrast to the picture today when most are held in more general community spaces rather than special purpose buildings. Of course the basic information in the GB1900 gazetteer is simply a location and a text string identifying a feature at that location at a particular point in time. It will not give you any more details about the history of that feature or location. However, it does give you a list of features in a particular location and their relationship to the real world for use as an index towards exploring the local history related to that place in more depth. Today we are launching a new website, www.gb1900.org, which needs your help! We are looking for on-line volunteers to transcribe and confirm all the place names from early twentieth century six inch to one mile scale maps of Great Britain. The final list aims to be the most detailed historical place-name gazetteer ever created, including approximately three million names for everything from towns and villages down to individual farms and physical features such as hills and woods. The final confirmed names will be made available under a creative commons licence, meaning everyone will be able to access it. This project leads on from an earlier Welsh project, cymru1900wales.org, and has been created by a collaboration involving the Great Britain Historical GIS Project at the University of Portsmouth, the National Library of Scotland, the National Library of Wales, the Royal Commission on the Ancient and Historical Monuments of Wales, the Centre for Advanced Welsh and Celtic Studies at the University of Wales and the People’s Collection Wales. We are currently working to revise A Vision of Britain through Time to include the 2011 Census of Population. Our aim is to launch a revised site in the spring of 2016. This means not just adding 2011 statistical data, but re-working all the re-districted historical data so that it uses the same geographies and classifications as the results from 2011 — so no small task. This rebuilding has been made possible by funding from the European Union’s Directorate-General for Regional and Urban Policy and from the Greater London Authority, to re-district historical data to 2011 geographies, for their own use. Those projects are now complete, but as the EU project was limited to simple head counts while the GLA project was limited to London and came up only to 1961 we now need to broaden out the work. The graph above is an early result of this work. From 1921 onwards the British census has gathered data on “industry”, meaning a classification of the business of workers’ employers, as well as “occupations”, meaning what workers individually did. Currently, Vision of Britain contains none of this data, but we have now computerised the 1931 and 1951 Industry Tables for the south east of England, and are adding data for the rest of England and Wales, and hopefully Scotland, with support from the Centre of Cities. We then re-classified these data to the Standard Industrial Classification (2007), and re-districted them to the Local Authority Districts of 2011. The graph simplifies the SIC Divisions down to just five broad sectors, and presents overall totals for Greater London. 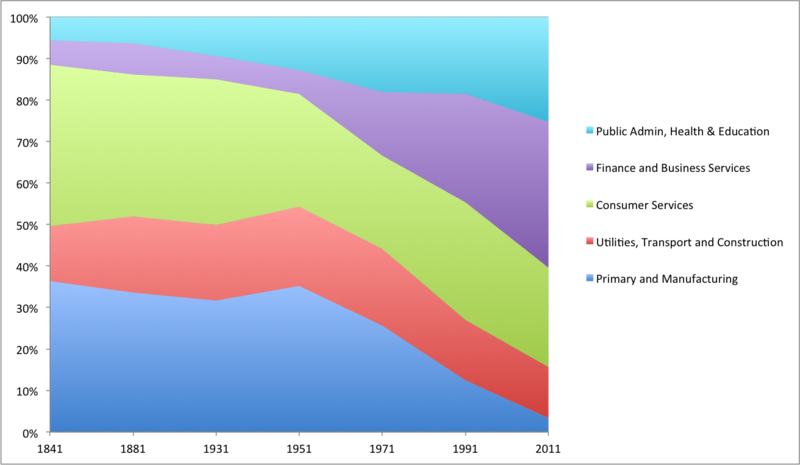 It also, of course, includes 1841 and 1881 occupational data and industry data for 1971, 1991 and 2011. Trends between 1931 and 1951 are misleading as the former data are based on where people lived, while data for 1951 and all later years are by workplace. We are also hoping to revise the site’s design, and it will definitely be running on a new server, our fifth since we launched in 2003, as that has already been delivered. The infrastructure that our sites and services run on is being upgraded. Whilst this is happening the Vision of Britain and related web sites and services will be completely, or partly, unavailable between 9 am and 4 pm on Saturday 17th January 2015. This weekend saw project director Humphrey Southall take part in the annual Social Science History Association Conference. This year the meeting was held in Chicago with an “Organising Powers” theme. Humphrey presented a paper on “Early Life Conditions and Physical Capability in Mid-Life: Analysing the 1946 British Birth Cohort” in the session on “Lasting Impacts of Childhood Circumstances, which was held under the Economics, Children and Childhood, Family/Demography and Health/Medicine/Body networks. He also chaired a session on “Social Networks in Space and Time” for the Historical Geography network. This is being written at the Eduwiki conference in Cardiff, where I gave a presentation on the first year course I run, which uses both A Vision of Britain through Time and Wikipedia as teaching resources. Each student is assigned a different village, and more specifically a Wikipedia article about a village. Even more specifically, the villages are all also Civil Parishes, and the article are what Wikipedia call stub articles, containing just a couple of sentences. The students’ task is to “substantially extend [their] assigned Wikipedia article to provide a rounded description of the place and, in particular, an account of its historical development”. Substantially extend means they have to turn those two sentences into four sides of A4 paper, when printed out. We deliberately use parishes far from Portsmouth that the students don’t know, so this is all about researching using online sources, not observing, and of course a major online resource for researching British villages and parishes is Vision of Britain. Obviously, someone with real local knowledge could do a better job, at least on what the village is currently like, but we work only with articles which have had no work done on them for at least a year, so local people don’t seem interested. Incidentally, the above examples show why we have been putting a lot of work into redesigning the URLs in Vision of Britain: the URLs from Neighbourhood Statistics and Hist-Pop are horrendously complex and it is very hard to be sure either which bits are really necessary, or whether they will carry on working long term. Both we and Wikipedia use much shorter and clearer URLs. The disadvantage of our purely numerical identifiers for places and units is that nothing in the URLs tell you where they are about, but the advantage is that unlike Wikipedia you don’t need to worry about which broader area is also named to identify the place unambiguously: currently Sawley is in the county of NorthYorkshire, but historically it was in the West Riding of Yorkshire; as was another Sawley which is now in Lancashire.